Bernice Thornton Banning was born on February 21, 1885, in Providence, Rhode Island, and graduated from Brown University in 1905 and the University of Wisconsin in 1910. In 1916, she set out for the Far East, to travel in Japan, China, and India, and to teach in Ceylon. She was appointed the first principal of the Buddhist Girls School in Ceylon and filled that post for a year, from January to December 1917. The school, founded by Celestina Dias, also known as Mrs. Jeremias Dias, was located in a house called "The Firs" on Turret Road in Colombo. Now called Visakha Vidyalaya, the school has since moved to larger quarters. After completing her stint at the Buddhist Girls School, Bernice continued in her travels in Ceylon and India. In 1923, she applied for a passport at Madras, India, so that she might stay on there "for the purpose of study and recreation, on behalf of the Theosophical Society." The Theosophical Society, founded in 1875 by Helena Blavatsky and her associates, established its International Headquarters in Madras, a suburb of Adyar, India, sometime before the turn of the century. I don't know how long Bernice Banning remained in the Orient, but by 1930, she had returned to the United States and was living in Meiners Oaks in the Ojai Valley of Ventura County, California. The head of her household was the elder Margaret Reed, Bernice's companion in her Asian travels. Bernice continued in her work as a teacher. (She had taught at least as far back as 1910 when she was a university instructor.) She also wrote, though perhaps only a little for publication. Her story, "Finger of Kali," was published in the Winter 1931 (or Dec. 1930-Jan. 1931) issue of Oriental Stories. Oriental Stories, then in its second issue, would have been the perfect place for Bernice to display her knowledge of the Far East. The only other credits I have found for her are pieces written for The Adyar Bulletin, a theosophical publication, and printed in the July 1915 and February 1919 issues. Bernice T. Banning died on September 28, 1954, in Ventura County, California. She was sixty-nine years old. Bernice T. Banning hailed from Providence, Rhode Island, the hometown of H.P. Lovecraft of Weird Tales fame. Bernice was five years his senior and far more actively engaged in the world than was Lovecraft. But could they still have met? Chances are they did, or--if nothing else--that Lovecraft knew of the Banning family. Bernice's father, Edwin Thomas Banning, was born on May 11, 1864. Although he came into the world in Donelson, Connecticut, Banning was descended from John Thurston (1750-1822) of Newport, Rhode Island. Banning attended Brown University in Providence but left school to become a draftsman and architect. On June 13, 1883, he married Isabel Thornton of Providence, originally from England. In 1910, the Banning family was enumerated in the U.S. Census in their residence at 88 Benefit Street in Providence. At that time, Lovecraft, aged twenty, was living at 598 Angell Street, about a mile and a half east of the Banning residence and on the opposite side of College Hill and the Brown University campus. Just down the street from the Banning house, at 135 Benefit Street, stood a large colonial house called the Stephen Harris mansion. Reputed to be haunted, the house served as a model for Lovecraft's "Shunned House" from his story of the same name, written in 1924 and published in 1937. Lovecraft's aunt, Lillian Clark, lived in the house prior to his mother's death in 1921. I have walked out in the rain--and back in the rain. And dropped my eyes, unwilling to explain. . . . Although he was a recluse and often on the verge of mental illness and physical and emotional collapse, Lovecraft knew his city well, walking over Providence at all hours, alone or with friends. He was an avid admirer of architecture and a thoroughgoing anglophile. He also had a strong bias in favor of old New England families like his own. The Banning family--tied to the Phillips family, that is, Lovecraft's mother's family--could no doubt have been an attraction and may even have been a distant relation through marriage. The distance to their home from his was really no distance at all. And of course his aunt lived just a couple of blocks away, although it isn't clear to me that she lived on Benefit Street at the same time as the Banning family. Lovecraft's story, "The Call of Cthulhu," might offer some clues as to possible connections. The second paragraph of the story begins: "Theosophists have guessed at the awesome grandeur of the cosmic cycle wherein our world and human race form transient incidents." Lovecraft mentioned theosophy in several other places in his work, and though it's unlikely he fell for its beliefs, there was probably something there for him, at least as a source of ideas, mood, or atmosphere. Bernice Banning was of course interested in theosophy, traveling halfway around the globe to study at its world headquarters. Second, Lovecraft alluded to "a widely known architect with leanings toward theosophy and occultism [who] went violently insane" at the time that Cthulhu's island crypt rose from the ocean floor. There isn't any indication that Banning was the model for Lovecraft's architect, but was there any other architect closer at hand? Finally, the narrator of "The Call of Cthulhu" is a Bostonian named Francis Wayland Thurston, the same surname as Banning's ancestor. Edwin Thomas Banning left Providence and settled in San Diego in 1912, where he continued in his practice. At that time, Lovecraft would have been just twenty-two years old and in the depths of a personal--even existential--crisis. He may not have known or cared that the Banning family had departed. Banning is listed in Edan Hughes' Artists in California, 1786-1940, though I think only briefly. He passed away on May 18, 1940, in San Diego. I suspect that if Lovecraft didn't know them personally, he knew of the Banning family and would have seen them in the street, at the market, or on the streetcar. He no doubt walked by their door many times in his ramblings over that old city of Providence. Girasol Collectables has reprinted the complete Oriental Stories/Magic Carpet Magazine. You'll find Bernice's story in those pages. Otherwise, I don't know of any sources for her stories or biography. 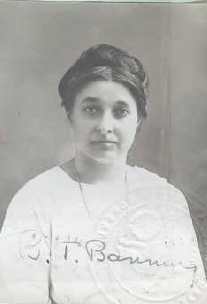 Bernice T. Banning, her passport photo from 1923. In reading Strange Angel: The Otherworldly Life of Rocket Scientist John Whiteside Parsons by George Pendle (2005), I have found out that Jiddu Krishnamurti (1895-1986), so-called "World Teacher" of theosophy, settled in Ojai, California, in 1922. He spent most of the rest of his life there and associated himself with other theosophists, including Rosalind Edith Williams Rajagopal (1903-1996). Rosalind founded the Happy Valley School, now the Besant Hill School of Happy Valley, in 1946, in Ojai. (The school is no doubt named after Annie Besant, the British theosophist.) I wonder if Bernice Banning and Margaret Reed followed Krishnamurti to Ojai, and if Bernice taught at Happy Valley after its founding. Nard Jones was the kind of writer every state and region hopes for, a writer with a sense of place, someone rooted in his native soil, an author who writes about his home truthfully, lovingly, and respectfully. Jones wrote the first novel in which his home city of Seattle is not just a setting, but a real place, essential to the story. He is also credited with the first detective novel set in Seattle. The focus of his many novels and historical books is the Pacific Northwest--Washington and Oregon--where he was born, lived, worked, and died. Maynard Benedict Jones was born on April 12, 1904, in Seattle. Between 1919 and 1927, he lived in Weston, Oregon, where he went to high school and where he was a columnist for the Weston Leader. At Whitman College in Walla Walla, Washington, Jones founded Blue Moon, a literary magazine, and served as campus correspondent for the Walla Walla Daily Bulletin. Graduating with honors, Jones set out on a career in journalism, eventually becoming chief editorial writer for the Seattle Post-Intelligencer. He also began writing fiction. Nard Jones was a prolific author of short stories, writing over 300 in all. They were published in all manner of popular magazines: The Saturday Evening Post, Collier's, Liberty, Blue Book, Argosy, College Life, Breezy Stories, Smart Love Stories, This Week, The Passing Show. 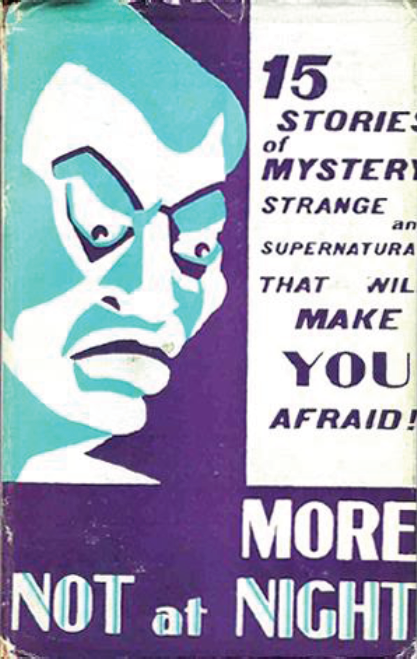 His only story for Weird Tales was called "Nomadic Skull"--a title that makes you want to pick up and read--and it was published in the May issue, 1933. Jones also wrote history and fiction for the book-reading crowd. There were eighteen titles in all, most in hardback, a few in paperback. His first novel, Oregon Detour (1930), was set in the fictional town of Creston, Oregon. The people of Weston, where Jones had lived as a youngster, saw themselves and their town in Oregon Detour. Like so many small-town novelists of his era, Jones--and his book--were subject of controversy back home. Copies of it kept disappearing from the public library. For years the people of Weston speculated on just who was supposed to be whom in the pages of Jones' novel. Jones followed Oregon Detour with The Petlands (1931), the first novel with a Seattle setting. He ended the decade with The Case of the Hanging Lady (1938), a detective novel, also set in his hometown. Jones served in the U.S. Naval Reserve during World War II as a public relations officer in Seattle. 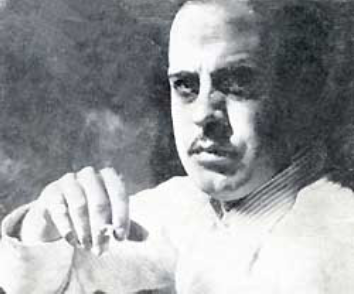 That experience gave him the material he needed to write his postwar novel, The Island (1948). Other novels and local histories followed, the last, published posthumously, entitled simply Seattle (1972). During the early 1960s, Jones wrote and narrated a radio program called "Puget Sound Profiles," broadcast over a dozen Washington State stations. He died a decade later in the city of his birth, on September 3, 1972. Nard Jones is still a popular writer in the Pacific Northwest. His books and biographical information are easy to find, including on the Internet. Writer Maynard Benedict "Nard" Jones (1904-1972). 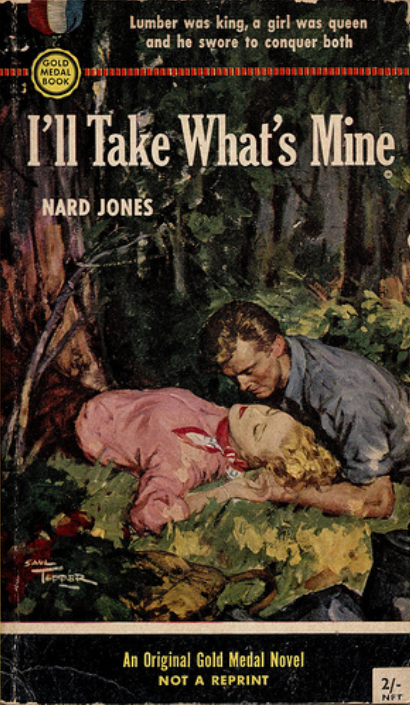 The cover of Nard Jones' 1954 novel, I'll Take What's Mine, with cover art by Saul Tepper. The male character looks an awful lot like Kirk Douglas, one of the biggest Hollywood stars of the 1950s. Helen Van Arsdale Rowe Henze worked as a secretary in a company that manufactured Portland cement, but on the side she wrote poetry. Or maybe I should say that she wrote poetry and worked in industry as her sideline. In any case, she was born on December 21, 1899, in Springfield, Pennsylvania, but moved to Kansas City as a child. Helen went to school at Kansas City Junior College and the Sarachon-Hooley Secretarial School in Kansas City. Her marriage to Raymond Philip Henze appears to have been a brief one. It's end may have prompted her going to work. Helen Rowe Henze worked as a secretary at the Ash Grove Lime and Portland Cement Company for twenty-seven years, retiring in the same month that she turned 62. She authored five volumes of poetry during those years: Song To Life (1948), Each Man's World (1950), Strange Is the Heart (1951), Arise, My Love (1953), and The Odes of Horace, Newly Translated from the Latin and Rendered in the Original Metres (1961). (There is mention of another book, The Bright God, in the description of a collection of her papers, but I don't know whether the book is hers or if it was ever published.) She also wrote short stories, including one story for Weird Tales, "The Escape," published in the June 1923 issue of the magazine. Her work was published in many newspapers and magazines, including the New York Times, Kansas City Star, Washington Post, Saturday Evening Post, Ladies Home Journal, and Prairie Schooner. Helen also attended conferences and lectures on poetry and creative writing, including the University of Kansas Writer's Conference in 1966. Finally, Helen was a singer and a lyricist. Her song, "The Half Loaf," was put to music by Andrew Lloyd Webber in 1961. Helen Rowe Henze, described as "a tall, handsome woman who speaks in a low voice," died in March 16, 1973, in Kansas City, Kansas. Helen's books and papers are still available, the latter at the State Historical Society of Missouri Research Center, Kansas City. 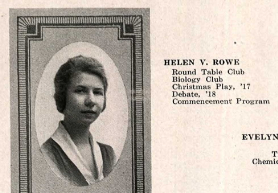 Helen V. Rowe from the Westport High School (Kansas City, Missouri) yearbook, The Herald, 1918. Helen Rowe Henze in a poor reproduction of a newspaper photograph from 1953. Helen Rowe Henze's lone story for Weird Tales appeared behind this cover, in the June 1923 issue, the magazine's fourth. Thanks to Randal Everts for providing further information on Helen Rowe Henze, including the photographs. Thanks to John Horner at the Kansas City Public Library for providing Helen's middle name. You begin your research simply enough, but before long, the extravagant complexity of lives intrudes. A simple biographical sketch becomes a mere introduction to a story too big for the confines of blog entry. (And what an ugly word, blog.) An author of a single story in and a single letter to Weird Tales is revealed to be a most interesting woman, her life embedded in a fascinating story that begins in twin forces of poverty and religious fervor and includes in its chapters: agitation, scandal, exile, the building of institutions, world travel, marriages beginning and ending in exotic places, and even a fatal fall from an Egyptian pyramid. The woman was Vennette Herron, a teller of weird tales and so much more. Poet and author Vennette Herron and her family all came out of the American Midwest. Her father, George Davis Herron (1862-1925) was a Hoosier, native of a small town with an exotic name, Montezuma, Indiana. His family was poor but devout, and Herron's childhood was "obsessed with premonitions of a religious world mission." He studied at Ripon College in Ripon, Wisconsin, from 1879 to 1882, in the process finding a wife in Mary V. Everhard, daughter of the mayor. The couple were married and Herron entered the Congregationalist ministry in 1883. For the next few years, the Herrons moved from state to state. Margaret Vennette Herron was born on September 11, 1885, in Zanesville, Ohio, her younger siblings in Wisconsin and Iowa. It was in Minnesota, however, that George Herron made a name for himself with an 1890 lecture, "The Message of Jesus to Men of Wealth." That lecture led to a position in the pastorate at Burlington, Iowa, then to a professorship created especially for him at Iowa College, now known as Grinnell College. The woman who endowed Herron's chair in Iowa was Caroline A. Sherfey Rand (1828-1905). 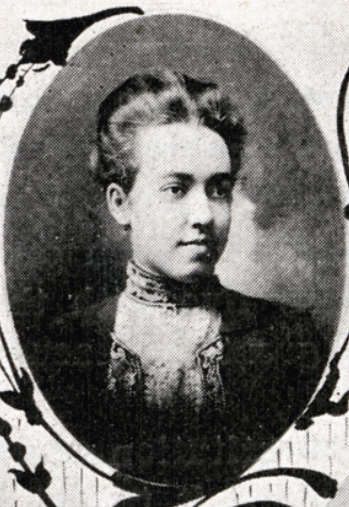 (1) Her daughter, Carrie Rand (1867-1914) (2), also with Iowa College, worked closely with Herron in his new post. Perhaps inevitably, the two became lovers, and Herron gave up his post, his marriage, and his family to be with her. Although he was still in Grinnell, Iowa, in 1900, his previous life was coming to an end. He and the younger Carrie Rand were married in 1901 in Rochester, New York. Defrocked and vilified, he retreated with his new wife to Florence, Italy. Vennette Herron, like her father, attended college when most people her age were still in high school, if in school at all. In 1900, at age fourteen, she was a college student in her adopted hometown of Grinnell, Iowa, where her father taught and lectured. A decade later, with the 1910 census, she was living in Newton, Massachusetts, with her mother and siblings. Vennette had married by then, but her husband, Charles B. Wagner, was nowhere in sight, at least in the enumerator's big book. 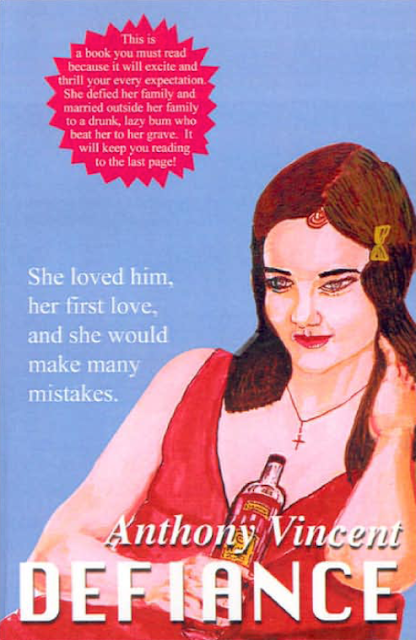 Although her occupation was listed as "None," Vennette had already started in her career as a writer. From before World War I and into the 1930s, she authored stories for a number of magazines, including The Smart Set, Ainslee's Magazine, Cosmopolitan, Women's Stories, Telling Tales, and Romance. Her book Perfume and Poison, a mix of verse and fable, was printed in 1917 by a publishing house in Boston. 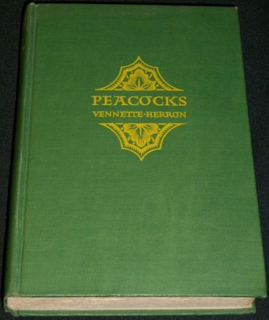 It is Miss Herron's curious achievement in "Peacocks" to paint for us a colorful and glamourous background of the East and yet, against that background, to show us people who become bored and estranged[,] and love which rather dies than endures. Twice-divorced and the product of a broken home, Vennette Herron knew something of love and the end of love. Vennette's father, George Davis Herron, married to Carrie Rand, and after her death in 1914, to Frieda Bertha Schöberle, fathered four more children. Elbridge Rand Herron, a child of George D. Herron's second marriage, died from a fall from the pyramid at Giza in 1932. The elder Herron--Congregationalist minister, teacher, lecturer, author, socialist, and activist--died in Bavaria, Germany, on October 9, 1925. (3) His very full life amounted to just sixty-three years. His daughter, Vennette Herron, wrote one letter to Weird Tales (Dec. 1934) and followed that up with a single story whose title almost looks like random typing, "Toean Matjan." The story, involving a tiger, appeared in the January 1938 issue of "The Unique Magazine" and was illustrated by Virgil Finlay. That is the last credit I have found for Vennette Herron. She died on March 15, 1973, in Lakeland, Florida, at the age of eighty-seven. (2) Carrie Rand was born on March 17, 1867, in Burlington, Iowa. She applied for a passport on November 8, 1899, for purposes of traveling abroad in about November 1900. Her mother, the aforementioned Carrie A. Rand (aka Mrs. E.D. Rand), applied for a passport the same day for the same purpose. She gave her occupation as "capitalist." She and her daughter were similarly occupied at the time of the 1900 census. (3) It's worth noting that George Davis Herron, a socialist, relied so heavily upon the auspices of a capitalist and upon the capitalist or free enterprise system. But this is always the case with socialists. There is a great deal of information available on George Davis Herron on the Internet, on Wikipedia and other sources. Indiana Authors and Their Books, 1816-1916 [Vol. 1], includes a lengthy entry on him. (The quote above is from that source.) His life and work would make a worthy project for a biographer. Vennette Herron's Perfume and Poison (1917) is available on the Internet. Her other books are common enough as to still be available, even on Ebay. 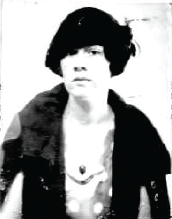 Vennette Herron's passport photograph, 1921, when she was in her mid-thirties and about to embark on a long and adventurous trip overseas. One of the outcomes of her time in other countries was her collection Peacocks and Other Stories of Java (1927). Revised slightly June 6, 2015. Thanks to Randal Everts for providing the death date and place of Vennette Herron. Thanks to A Family Member for corrections and clarifications. Robert Jere Black, Jr., was born on June 27, 1892, in McKeesport, Pennsylvania. Son of a physician, he turned to the arts for his living, writing stories and other pieces for slicks and pulps, including The Smart Set, Life, The Saturday Evening Post, Breezy Stories, Battle Stories, Sweetheart Stories, and College Life. His work for Weird Tales consisted of three poems published in 1928 and 1930. Black also wrote a non-fiction piece, "The Pseudo-Scientific Field," for Author and Journalist, published in May 1930. Science fiction fans are interested in Black's essay for its early look at their field, so early in fact that the term "science fiction" wasn't even in common usage yet. His work also came out in hardback in the 1934 novel, The Killing of the Golden Goose: A Christopher King Mystery Story. During World War I, Black served with the American Expeditionary Force in France from May 1918 to May 1919. A machine gunner, he was gassed by the Germans and suffered from ill health throughout his life. He returned to Europe in 1923 hoping to recuperate. In and out of the hospital, he continued to write, although I haven't found anything else by him from after 1934. In addition to McKeesport, Black lived in Chautauqua, New York; Washington, D.C.; Long Beach and Santa Monica, California; and Byron Center, Michigan. His life ended far from home though, in the home of Pablo Heuer, in Ajijic, Jalisco, Mexico. Ajijic, located on the shores of Lake Chapala, had been a magnet for writers, artists, and entertainers since the 1920s. D.H. Lawrence, David Herbert, Somerset Maugham, Tennessee Williams (another teller of weird tales), and the writing duo known as Dane Chandos all lived there at one time or another. Elizabeth Taylor, Charles Bronson, and other Hollywood stars were drawn to the area in later years. In any case, Robert Jere Black, Jr., described by his brother as "a brilliant, fascinating person," died in that writer's haven on September 7, 1953, after thirty-five years a casualty of World War I. His body was interred at the Ajijic Municipal Cemetery the next day. Black's wife, known as E. Best Black, was also a writer of genre fiction. Born Josephine Elizabeth Best in 1894 in Meadville, Pennsylvania, she was the daughter of Dean Wesley B. Best of Allegheny College. Josephine and Jere Black married in 1920 in her home town and traveled widely after that. She wrote two hardback novels, The Ravenelle Riddle (1933) and The Crime of the Chromium Bowl (1937). Her detective was named Peter Strangley. She also wrote a story with the punning title of "Flaming Ruth" for Young's Realistic Stories Magazine for February 1928. 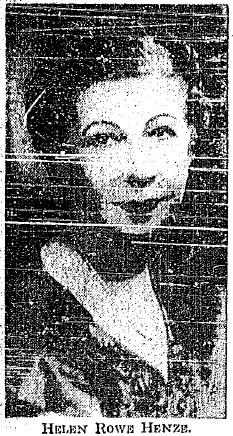 She later remarried, her new husband being named Theron Lowden Kelley (1899-1967). Josephine Elizabeth Best Black Kelley died in 1976. Black's essay, "The Pseudo-Scientific Field," was reprinted in the magazine Blood and Thunder #11 in the summer issue 2005. 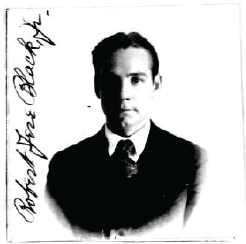 Writer Robert Jere Black, Jr. (1892-1953), his passport photo from 1922. Thanks to Randal Everts for information on Black's life and death and on his wife's life and career. Arthur Beecher Waltermire was born on September 10, 1888, and died on July 30, 1938. In between those two dates, Waltermire served, studied, wrote, traveled, played music, and taught hundreds if not thousands of students. He came into the world in Findlay, Ohio, the son of a lawyer. (1) He served three years in the Ohio National Guard and studied at Ohio State University, where his wife, Adelaide, was treasurer of the Dames' Club. When he filled out his draft card in 1917, Waltermire was teaching at Ohio Northern University in Ada, Ohio. By 1920, he and his wife had moved to Columbus, presumably so he could continue in his teaching career. Waltermire was a musician and teacher of history at North High School in Columbus. He was also an author, writing a single story for Weird Tales, "The Doors of Death" (October 1936; C.L. Moore's story, "The Tree of Life" appeared in the same issue). Waltermire passed through those doors less than two years after his story was published, on July 30, 1938, probably in Columbus. He was a few weeks short of his fiftieth birthday. His yearbook remembered him as "[b]eloved friend and counselor to all." Waltermire's story is available as a download on the Internet. (1) Waltermire's father was Beecher Wesley Waltermire (1858-1932), a lawyer, lecturer, and writer born in Sedalia, Missouri, and orphaned during the Civil War. 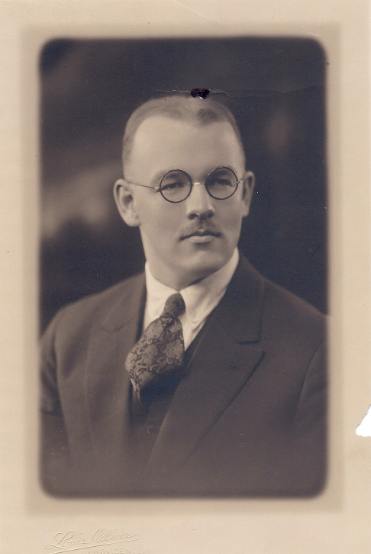 The elder Waltermire practiced law in and served as mayor of Findlay, Ohio. He later lived in Columbus. His books include The Adventures of a Skeleton, A Tale of Natural Gas (1890), Around the Wigwams of the Wyandots (1892), and Buckeye Ballads (1906). In addition, he wrote stories and verse for magazines and newspapers. See The Magazine of Poetry and Literary Review, Vol. 7 (1895) for more information, including a photograph. 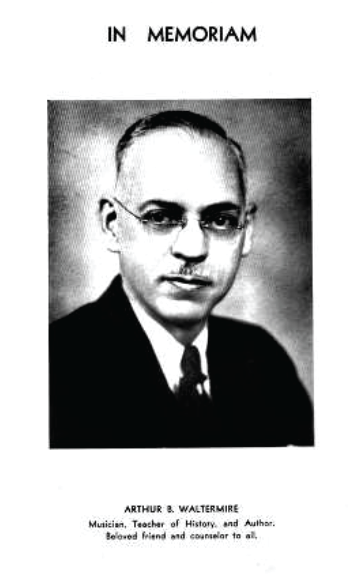 Arthur B. Waltermire, remembered in his high school yearbook, 1939. Cover art by Margaret Brundage, a birthday remembrance for someone who is missed. In doing the research for this blog, I have found that real life is often weirder and sometimes more horrifying than fiction. The death of Anthony Digiannurio is a case in point. A retired architect and a veteran of World War II, he was taken from a nursing home to a Florida hospital shortly before he died. Apart from bedsores on his elbow and a catheter inserted incorrectly into his bladder, apart from an infected breathing tube, Digiannurio had maggots in his eye. Put into the care of a nursing home, he had living maggots in his eye. If we were reading about such a thing in an issue of Weird Tales, we would shudder, close the magazine, turn off the light, and sleep soundly. Not so easy in the real world. Anthony Vincent Digiannurio was born on August 30, 1925, in Pittsburgh, Pennsylvania. During World War II, Digiannurio saw combat with the U.S. Army in Europe. Discharged in April 1946 when he was not quite twenty-one, he waited until 1988 to receive a Purple Heart for a wound received on September 8, 1945, after hostilities had ended. While in Europe, he sent an engagement ring to his future wife. The couple were married and spent the next five decades together. On their fortieth anniversary, Digiannurio surprised his wife with the gift of a fully furnished home in Deltona, Florida. 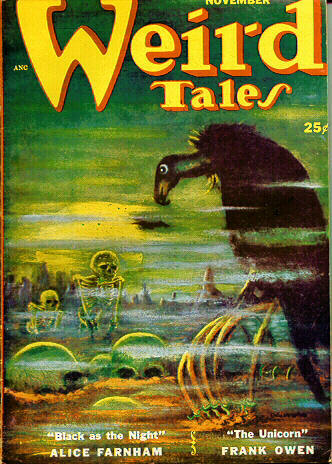 I have made the assumption that the Anthony Digiannurio born in Pittsburgh in 1925, a painter, writer, and architect, was the same Anthony Di Giannurio who created illustrations for Weird Tales, including one cover, during the magazine's last two years in print. If I'm wrong in that assumption, I invite a correction. In any case, the artist Di Giannurio began in a big way with the cover and an interior illustration in the November 1952 issue of Weird Tales. He illustrated at least five more stories before the magazine met its end in September 1954. If Di Giannurio became Digiannurio, then the young illustrator for Weird Tales went on to become an architect, poet, novelist, and painter. His poems were published in Whiskey Island Magazine, his novel, Defiance (as by Anthony Vincent), in paperback in 2001. (He wrote nine books in all.) Late in life, Digiannurio was placed in a nursing home. In November 2007, he was removed to a DeLand, Florida, hospital where his story made it out into the world. 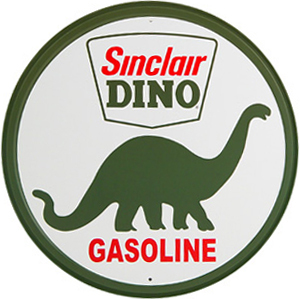 Although he bounced back a little, Digiannurio died two months later, on January 12, 2008. There are many accounts on the Internet of Anthony Digiannurio's last days. I would rather provide something about his long and productive life. The cover to Anthony Digiannurio's novel, Defiance, from 2011. The cover artist is unknown, but could the author have created this painting? Estella Frances Wynne was born on April 5, 1885 (or 1886), in San Francisco, California, daughter of Irish immigrants. As a student at Stanford University, she participated in theater and was associate editor of The Stanford Sequoia. She was also a published author, with stories in McClure's Magazine and The Overland Monthly. Stella, as she was known, graduated from Stanford in January 1907 and married a classmate, William Francis Herron, before the year was out. By 1920 she was divorced and supporting herself and her son as a magazine writer. Her stories appeared in Collier's, Harper's, Life, Woman's Home Companion, and other magazines. 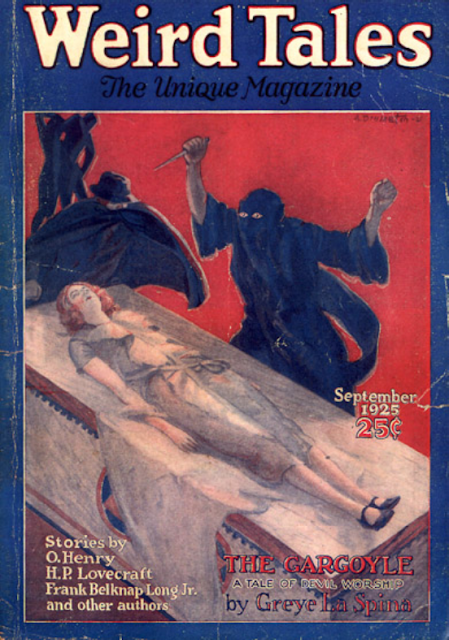 Her only work for Weird Tales was called "Ebony Magic," published in the March 1928 issue. Two of her works were adapted to the silver screen, Shoes (1916) and The Double Room Mystery (1917). She also wrote a book of poetry, Bowery Parade and Other Poems of Protest (1936), illustrated by the Mexican painter and muralist Jose Clemente Orozco (1883-1949); a play, Hearndon House, A Drama in Three Acts; and a piece that was included in Among the Humorists and After Dinner Speakers, Part Two (1909). Stella Wynne Herron died in the city of her birth on March 1, 1966. Several of Stella Wynne's stories are available on the Internet, on Google books and other sources. 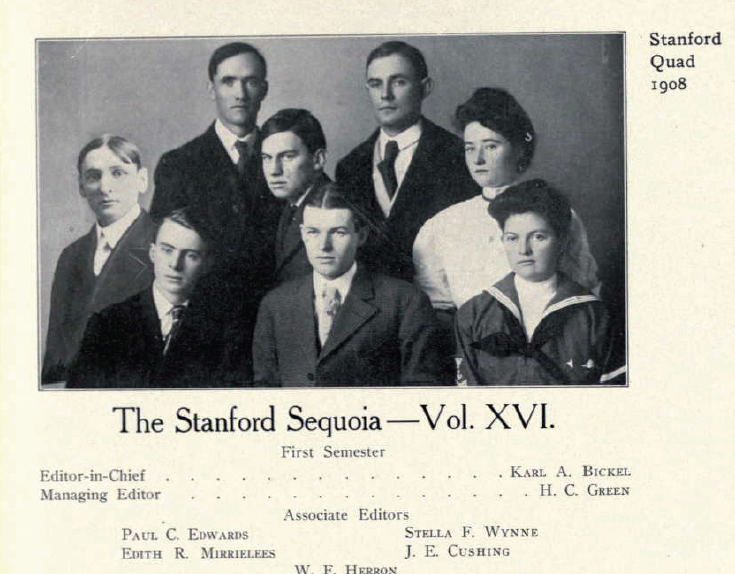 A snippet from the Stanford University yearbook for 1908 showing the staff of The Stanford Sequoia. Just who is who in the photo isn't exactly clear. Presumably one of the women is associate editor Stella Wynne. The photo of the man on the far left has been pasted in, the twentieth century equivalent to "Photoshopping." Peeking out of the bottom of this snippet is the name William F. Herron, Stella's future husband. Presumably he is in the photo as well. Thanks to Randal Everts for clarifications. Harold Freeman Miners, later a teller of weird tales, attended Michigan Agricultural College, the forerunner of Michigan State University, and graduated in 1913 with a Bachelor of Science degree in Agriculture. 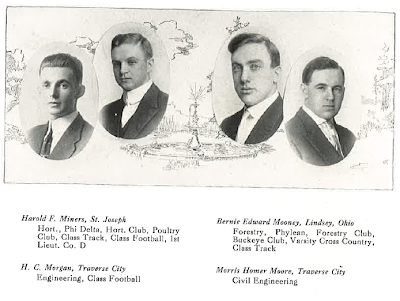 During his years on campus, he was a member of the Phi Delta Literary Society, Horticulture Club, Poultry Club, Class Track, and Class Football. He was also in the Corps of Cadets, serving during the 1911-1912 school year as 1st Lieutenant in Company D and during the 1912-1913 school year as Major in the 3rd Battalion. His promising young career stumbled when he contracted influenza while serving in the U.S. Navy during World War I. As a result of his ill health, he was forced to a more hospitable climate in the West in 1921. His life came to an end in a Denver sanitarium before the decade was out. 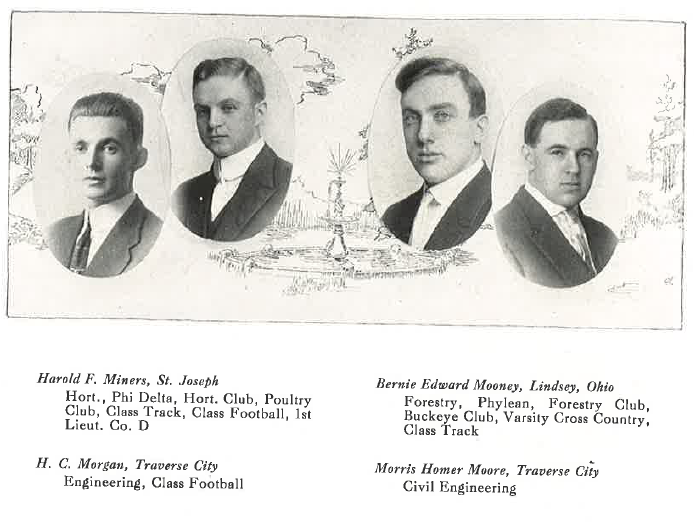 Harold Freeman Miners (far left) in his halcyon days as a student at Michigan Agricultural College, 1912. Thanks to Ed Busch, Archivist, University Archives and Historical Collections, Michigan State University, and Randal Everts for passing on information on Miners at college. né André Brosnatch or Brosnac, Jr. The first year in print for Weird Tales was a rough one. Poor sales along with changes in size, format, editors, and even publishers almost sank the magazine. 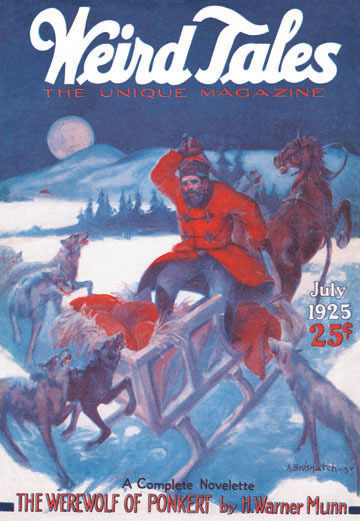 After the giant-sized, triple-issue, first-anniversary number, dated May/June/July 1924, "The Unique Magazine" went on hiatus. 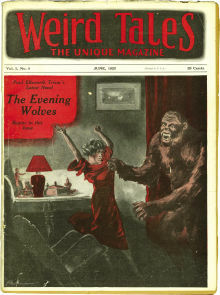 Weird Tales returned to the newsstand with its November 1924 issue and a new editor, Farnsworth Wright. Among its improvements, the magazine offered more illustrations, almost all of which for the next year and a half were drawn by an artist named Andrew Brosnatch. Despite the fact that Andrew Brosnatch created illustrations for one of the most treasured and sought-after of pulp magazines, little is known of his life. He was born André Brosnatch, Jr., son of an Austrian immigrant, on October 24, 1896, in Fayette County, Pennsylvania. 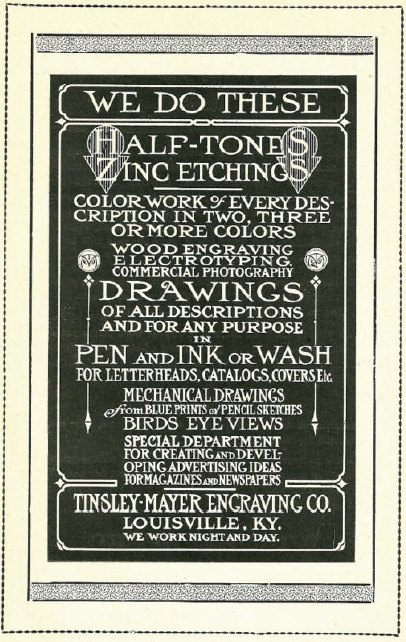 At the time he filled out his World War I draft card in 1917, Brosnatch was living in Louisville, Kentucky, and working for the Tinsley-Mayer Engraving Company, a hardworking firm that created every kind of commercial art, including letterhead, covers, catalogs, and calendars. By 1922, he was living in Chicago and studying art, the perfect time and place as it turned out, for Weird Tales was to come along only a year later. Brosnatch got his big break as an artist in mid-1924 with the reorganization of Weird Tales. Although every issue up to the point had included an illustration on the cover, interior art was relatively scarce. (In fact, the first two issues of the magazine lacked interior art entirely.) Farnsworth Wright changed that. 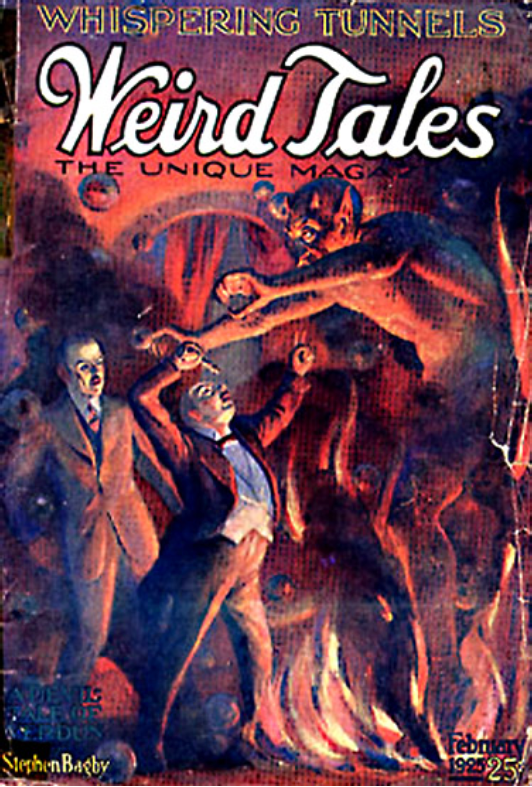 Beginning with the November 1924 issue, at least half the stories in each issue of Weird Tales were illustrated. The magazine also stuck to a monthly production schedule, requiring twelve cover designs per year. And, the letters column, known as "The Eyrie," came into focus. Like a workhorse, Andrew Brosnatch illustrated every part of the magazine--covers, interiors, and "The Eyrie" alike--for the next year and more, sometimes singlehandedly. 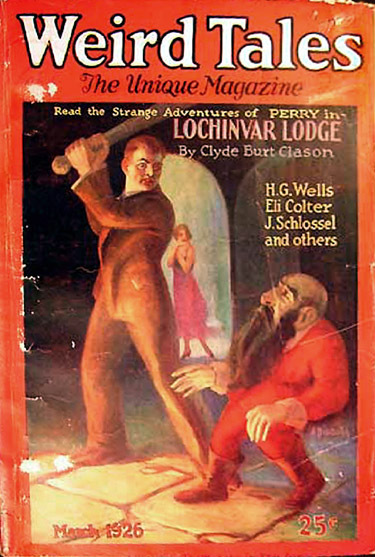 Brosnatch was the first illustrator to put together a long run as cover artist on Weird Tales. He created fifteen covers in all, including every cover between November 1924 and November 1925. He was also busy every month with interior illustrations, often illustrating the entire issue by himself. (He was the only illustrator credited for the April, July, September, October, and November 1925 issues.) 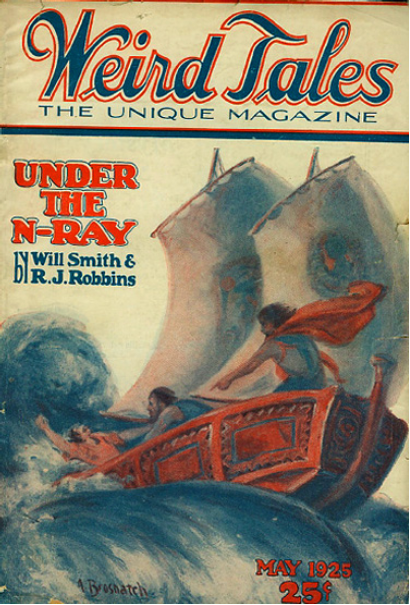 "The Eyrie" had appeared in Weird Tales before Farnsworth Wright took over the magazine, but only after November 1924 did it become a favorite feature. Long after Brosnatch had left Weird Tales, his decoration for "The Eyrie" remained, even to the last issue, September 1954. By the May 1926 issue of "The Unique Magazine," Andrew Brosnatch had given out. New artists--Ed Witham, E.M. Stevenson, George Olinick, C. Barker Petrie, Jr.--came on to take his place. Brosnatch's last cover for Weird Tales appeared in March 1926, his last interior illustration (except for his heading for "The Eyrie") the following month. That is his last known credit as an artist as far as I have found. 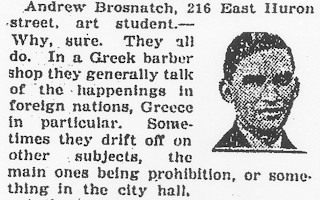 The 1930 census found Brosnatch still living in Chicago and working as a commercial artist. His housemates and neighbors included artists Lavergne Louisburg, Neil Slocum, David A. Koves, Philip Viviano, George D. Anderson, and William G. Connelly. Neil Slocum was also a pulp artist, having recently illustrated stories for Real Detective Tales, a magazine originally published as a companion title to Weird Tales. He went on to illustrate a couple of children's books, Billy the Kid's Pledge by Robert Marshall (1940) and Vic Sands of the U.S. Flying Fortress Bomber Squadron by Roy Snell (1944). William Connelly was an instructor at an art school, the Croydon Institute of Chicago. Brosnatch's trail goes cold again until 1942 when he filled out his World War II draft card. By then he was living in New York City and employed in an unknown capacity by Charles A. Nixon. Brosnatch was only forty-six years old in 1942, yet nothing more is known of his life until a record of his death on December 26, 1965, in Los Angeles, California. His last published work may have been a cover illustration for The Brain in the Jar and Others: Collected Stories and Poems by Richard F. Searight (1992). Although I haven't seen the illustration, I suspect it is simply a reprint of Brosnatch's art from that first issue, November 1924. Despite his obscurity and only mild praise by aficionados of Weird Tales, Andrew Brosnatch, with his monsters, fiends, demons, and oversized arthropods, deserves some credit for having helped saved the magazine during its early and perilous days in print. 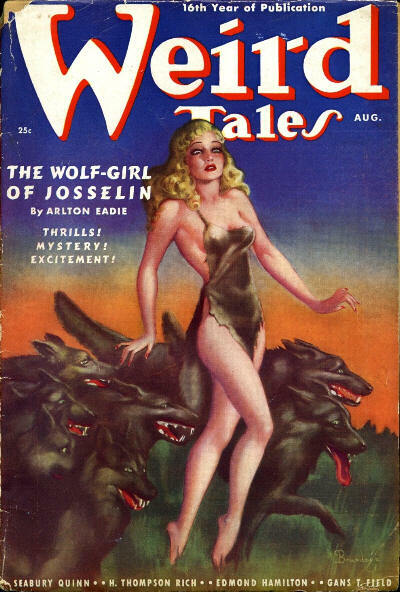 Many of the artists for Weird Tales have gotten short shrift, as artists so often do. There is little that I know of available on Brosnatch and many others like him, but at least we have their art, which may be as much as they ever wanted. Here is a three-color cover from about halfway through Andrew Brosnatch's year-long run as cover artist for Weird Tales. It's supposed to illustrate a werewolf story, but it looks more like a Russian folktale. Another three-color cover with a strong composition and not much narrative. 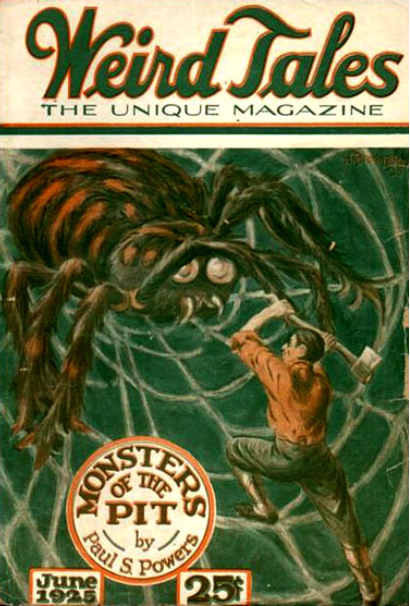 The ever-popular giant spider, which has done battle with Conan, The Incredible Shrinking Man, and a pair of Hobbits, among countless other protagonists. Poor Andrew Brosnatch. Only months before he got to draw a giant spider. 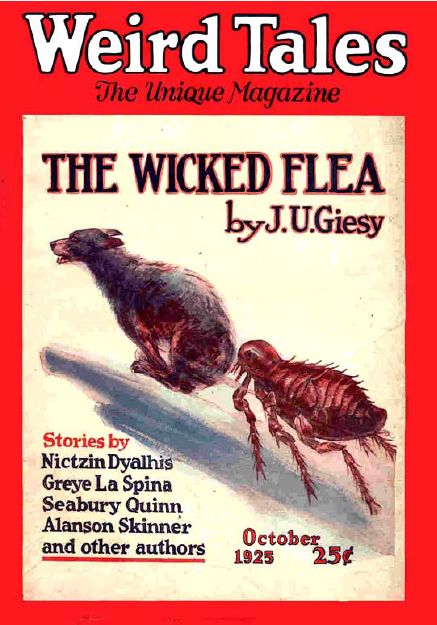 Now, in October 1925, he's forced to show a giant flea chasing a terrified dog. This may be the most ridiculous of all Weird Tales covers. Was the content of that month's magazine really so poor that J.U. Giesy's story made the cover? Speaking of Hobbits, here is Andrew Brosnatch's early version, before there was such a thing. Another three-color cover with a nicely drawn demon. Andrew Brosnatch created not only cover art but also black-and-white interior illustrations. Here is his heading for "The Eyrie," the long-running letters column of Weird Tales. And here, his illustration for H.P. 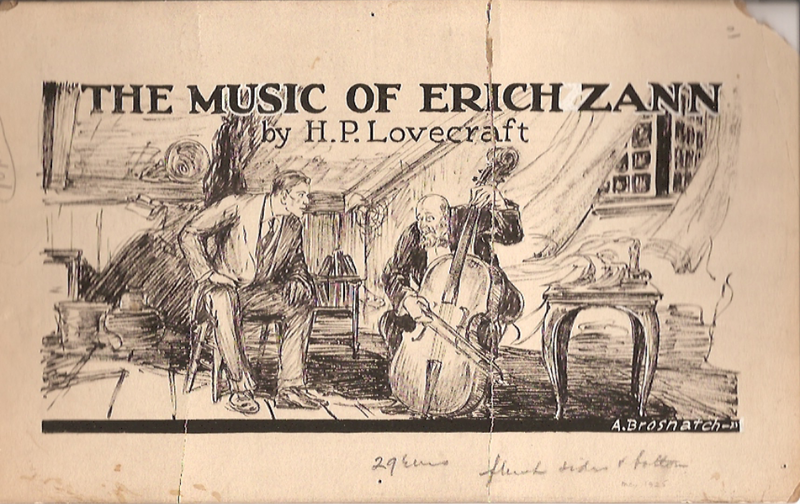 Lovecraft's story, "The Music of Eric Zann" (May 1925). Before moving to Chicago, Andrew Brosnatch worked for the Tinsley-Mayer Engraving Company of Louisville, Kentucky. Here's an advertisement from 1912 showing just how hard its artists worked. Finally, what collection of pulp art would be complete without the robed fiend who threatens the helpless woman while the masked hero rushes on to save her? Brosnatch's cover for the September 1925 issue of Weird Tales is something of a cross between the terror pulps and the hero pulps. 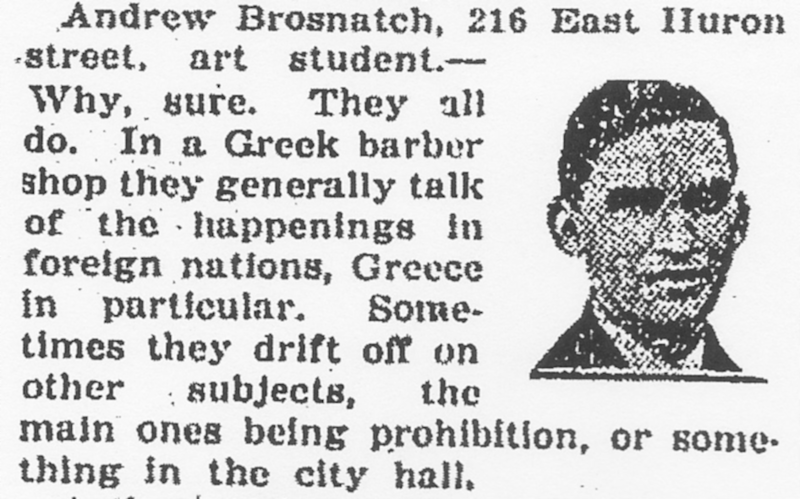 Postscript: A scanned version of a digital printout of a digital scan of a microfilm photograph of a reproduction on newsprint of a photograph taken of Andrew Brosnatch. Is there any wonder why the image is so poor? But is there any other image of the artist anywhere in existence? From the Chicago Tribune and its feature, "The Inquiring Reporter" (Jan. 5, 1922), in answer to the electrifying question: "Does your barber talk to you while you are being shaved?"